In general, how much trust and confidence do you have in the mass media such as newspapers, TV and radio -- when it comes to reporting the news fully, accurately and fairly -- a great deal, a fair amount, not very much or none at all? In general, do you think -- [ROTATED: news organizations get the facts straight, (or do you think) news organizations' stories and reports are often inaccurate]? Which comes closer to your opinion -- [ROTATED: that the news media generally favor one political party over the other, (or) that the news media generally favor neither political party]? And which political party do you think the news media generally favors -- [ROTATED: Republicans (or) Democrats]? In its coverage of [...] and his administration so far, do you think the news media has been too tough, about right or not tough enough? In the disputes between President Trump and the news media, in general, do you -- [ROTATED: strongly side with Trump, lean toward Trump, side with neither Trump nor the media, lean toward the media (or) strongly side with the media]? In general, do you think the news media are -- [ROTATED: too liberal, just about right or too conservative]? As you may know, the information about the government program was leaked to The Guardian and Washington Post newspapers by a former U.S. government contractor. Do you think it was right or wrong for the newspapers to publish that information? As you may know, a former U.S. government contractor named Edward Snowden has claimed to be the source of the information about the government program reported in The Guardian and Washington Post newspapers. Do you think it was right or wrong for him to share that information? Please indicate how often you get your news from each of the following sources -- every day, several times a week, occasionally or never. How about -- Local newspapers in your area? Please indicate how often you get your news from each of the following sources -- every day, several times a week, occasionally or never. How about -- National newspapers such as the New York Times, the Wall Street Journal and USA Today? Please indicate how often you get your news from each of the following sources -- every day, several times a week, occasionally or never. How about -- Nightly network news programs on ABC, CBS or NBC? Please indicate how often you get your news from each of the following sources -- every day, several times a week, occasionally or never. How about -- Morning news and interview programs on the national TV networks? Please indicate how often you get your news from each of the following sources -- every day, several times a week, occasionally or never. How about -- Cable news networks such as CNN, Fox News Channel and MSNBC? Please indicate how often you get your news from each of the following sources -- every day, several times a week, occasionally or never. How about -- Public television news? Please indicate how often you get your news from each of the following sources -- every day, several times a week, occasionally or never. How about -- Local television news from TV stations in your area? Please indicate how often you get your news from each of the following sources -- every day, several times a week, occasionally or never. How about -- National Public Radio? Please indicate how often you get your news from each of the following sources -- every day, several times a week, occasionally or never. How about -- Radio talk shows? Please indicate how often you get your news from each of the following sources -- every day, several times a week, occasionally or never. How about -- News on the Internet? And how often do you get your news from each of the following WEEKLY sources of news: every week, several times a month, occasionally or never. How about -- Weekly newsmagazines? And how often do you get your news from each of the following WEEKLY sources of news: every week, several times a month, occasionally or never. How about -- Television news programs on Sunday mornings? And how often do you get your news from each of the following WEEKLY sources of news: every week, several times a month, occasionally or never. How about -- TV news magazine shows during the evenings -- such as "60 Minutes," "20/20," "Dateline" and others? In general, do you think the local news media in your area are -- [ROTATED: too liberal, just about right or too conservative]? As you may know, "citizen journalism" is the process by which people use technology such as cell phone cameras, video recorders and internet websites to post pictures, stories and videos of news events they encounter. Do you think citizen journalism is likely to be more reliable or less reliable than the traditional news media? Do you, personally, have any concerns about the accuracy of reports made by citizen journalists, or not? Do you, personally, have any concerns about the accuracy of reports made by traditional journalists, or not? How likely is it that you, personally, would ever participate in citizen journalism -- very likely, somewhat likely, not too likely or not at all likely? 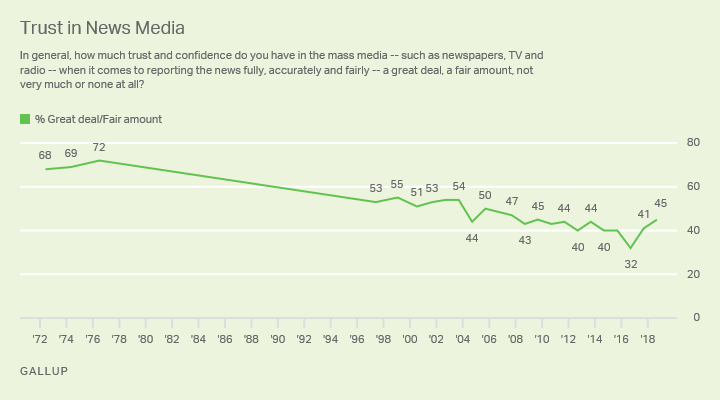 Americans' trust in the media has continued to improve from the record low in 2016, but remains lower than it was in the late 1990s and early 2000s. Americans' average rating of 25 U.S. industries and sectors is down from a year ago, but the rank order is similar. Computer and restaurant industries are at the top while the federal government and pharmaceuticals are at the bottom.